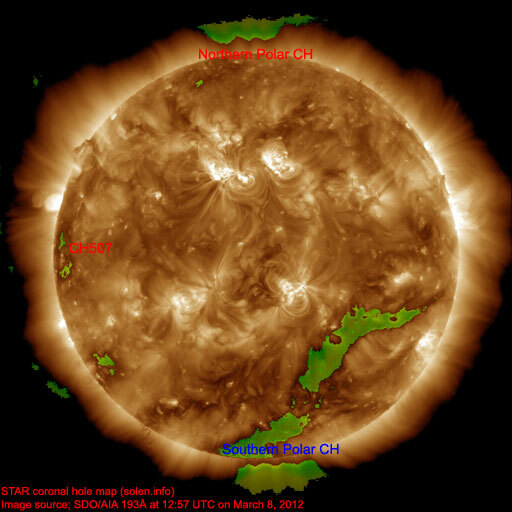 Last major update issued on March 9, 2012 at 05:55 UTC. Most recent minor update posted at 20:30 UTC. 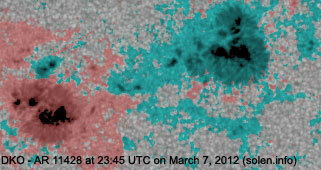 The geomagnetic field was quiet to major storm on March 8. Solar wind speed at SOHO ranged between 456 and 828 km/s. 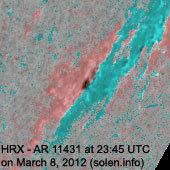 A strong solar wind shock was observed at SOHO at 10:53 UTC, the arrival of the CMEs observed after the X flares on March 7. The initial part of the geomagnetic disturbance was much weaker than expected. Although it is unpredictable what happens when two CMEs interact, it isn't unusual that the magnetic fields carried along by the CMEs are partly neutralized in the merge process. The disturbance has intensified early on March 9 with major storm conditions observed 01-04h UTC. 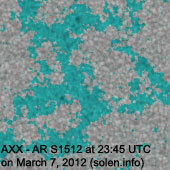 Solar flux measured at 20h UTC on 2.8 GHz was 139.5 (increasing 28.7 over the last solar rotation). The planetary A index was 28 (STAR Ap - based on the mean of three hour interval ap indices: 27.5). Three hour interval K indices: 21155643 (planetary), 10155533 (Boulder). Region 11429 [N17E03] lost penumbral area with the main penumbra fragmenting into smaller penumbrae. 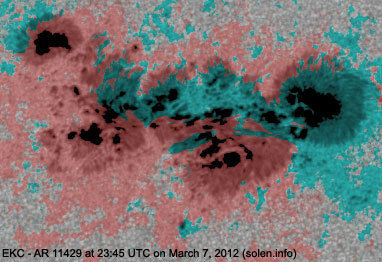 The region still has several magnetic delta structures and could produce further major flares. The region was the source of a long duration major M6.3 event peaking at 03:53 UTC on March 9. 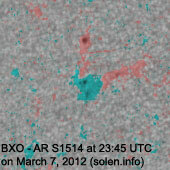 STEREO-B indicates that another full halo CME was produced by this event. Region 11430 [N21W13] decayed with the leading penumbra splitting into smaller penumbrae. There's only rudimentary penumbra left on the trailing spots. 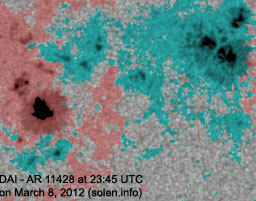 Region 11431 [S28W74] was quiet and stable. Minor update added at 11:10 UTC: As expected the CME earlier today was full halo in LASCO imagery. The current disturbance appears to be peaking at Kp 8. The planetary A index for the 07-10h UTC interval was 207 compared to 179 (Kp 8) one hour earlier. The very severe disturbance was caused by the interplanetary magnetic field being steadily strongly southwards for several hours. Over the last hour the IMF total field has weakened a bit and the southward orientation is not quite as strong. One magnetic delta structure was gone in region 11429 after the LDE and the center of the region is becoming quite open. 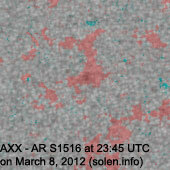 Several new ARs had spots at 10:00 UTC, see the most recent high resolution CHARMAP. S1517 was located at S23E33, S1518 at S26E23 while S1519 was at N06W25. 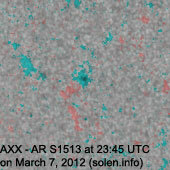 AR 11431 has developed slowly today, and there is spot development in the southern part of region 1428 as well. 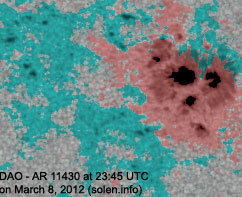 Minor update added at 20:30 UTC: AR S1515 at the east limb produced a C9.7 flare at 20:25 UTC. 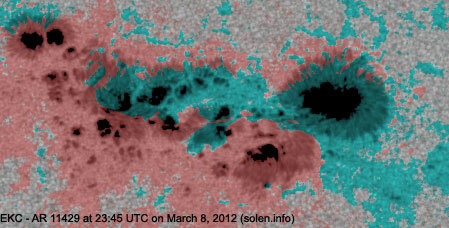 This region has all spots inside a single penumbra, and is a beta-delta region. Minor M class flares are possible. The disturbance that started yesterday is quickly decreasing in intensity. 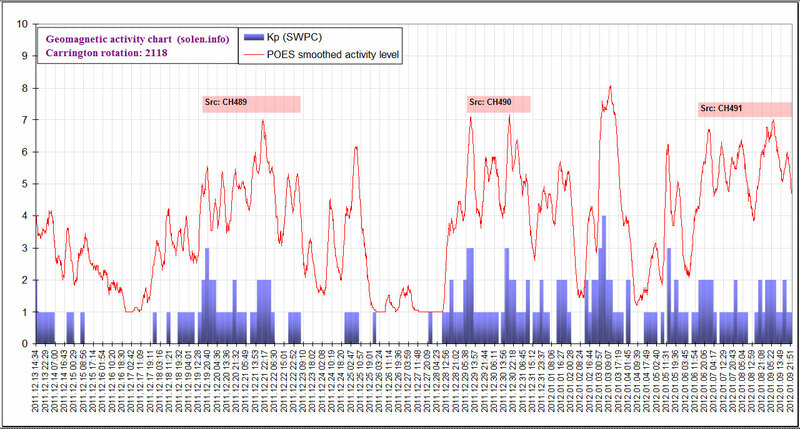 While max Ap was 207 for the 07-10, 08-11 and 10-13h UTC intervals, the IMF has weakened a lot and the most recent 3-hour interval has Ap at 12 (Kp 3). March 6, 8: No obviously Earth directed CMEs were observed in LASCO and STEREO imagery. 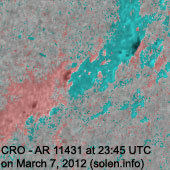 March 9: The M6 event in region 11429 appears to have produced a full halo CME. This CME could reach Earth during the latter half of March 10 or early on March 11. 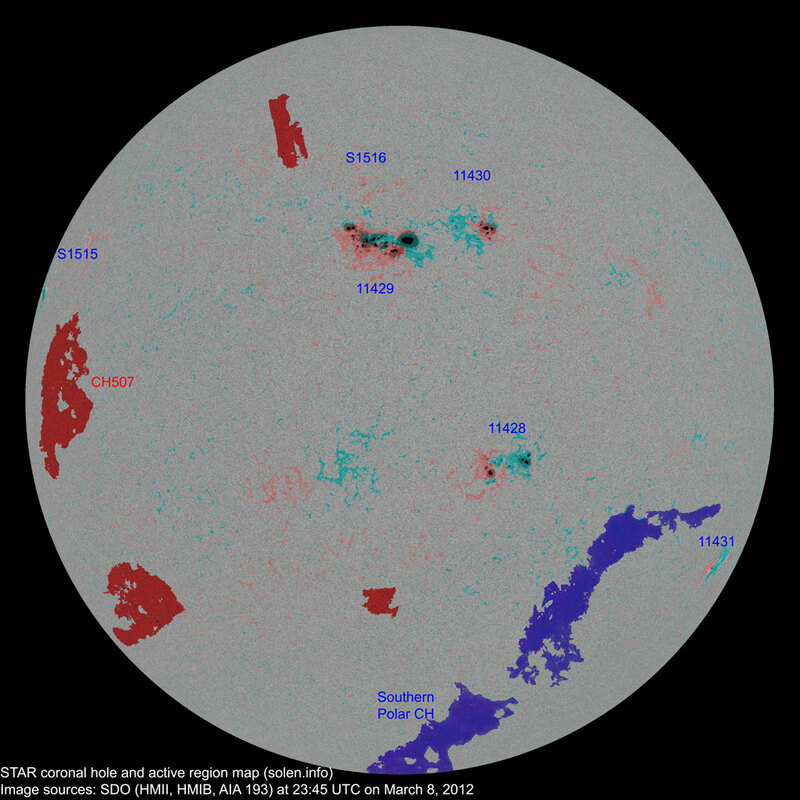 The geomagnetic field is expected to be unsettled to severe storm on March 9 and quiet to active initially on March 10. 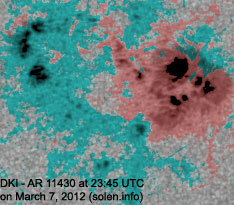 Late on March 10 or early on March 11 another CME impact is likely and could cause active to severe storm conditions. 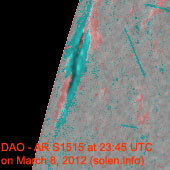 S1515 2012.03.08 2 1 N15E82 0080 DAO beta-delta?